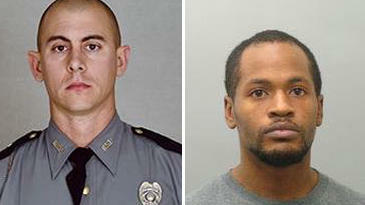 Images released by the Kentucky State Police show Trooper Cameron Ponder, left, and the man suspected of killing him, Joseph Thomas Johnson-Shanks. WEKU's Jonese Franklin reports trooper Joseph Cameron Ponder is the second trooper from western Kentucky's Mayfield post killed in the line of duty this year. Police say the man accused of fatally shooting a Kentucky trooper has been shot and killed after an hours-long manhunt. Trooper Jay Thomas, a state police spokesman, says 25-year-old Joseph Thomas Johnson-Shanks of Missouri was shot by police Monday morning when he refused to drop his weapon. He died at a hospital. Authorities say 31-year-old trooper Joseph Cameron Ponder was conducting a traffic stop Sunday night when the driver fled. After a chase, the suspect stopped his car abruptly and fired several shots into Ponder's cruiser. He died later at a hospital. Police had said Johnson-Shanks fled on foot. Numerous law enforcement agencies had been aiding in the search, using helicopters and dogs in the rural, wooded area.